The proud volunteers at WFNN in Groningen offer proof that a whisky festival can flourish without a looming corporate presence behind it. Martine Nouet finds spiritual sustenance inside Der Aa-Kerk. I only know two whisky festivals entirely organised by volunteers. I know there are more, but these are the only ones I regularly attend: The NB Spirits Festival in Fredericton, New Brunswick, on the third weekend of November; and Whisky Festival Noord-Nederland (WFNN) in Groningen at the end of March. Exceptionally, the latter was moved forward a week this year because of Easter. Is there any better place to host a spirits gathering than a spirited place like Der Aa-Kerk, a deconsecrated church? 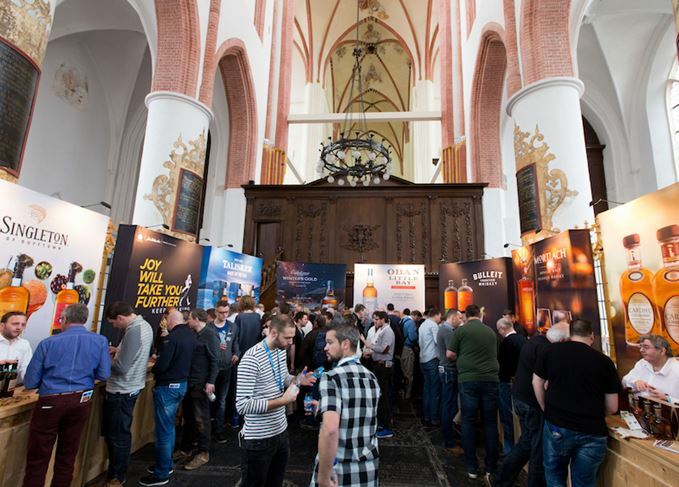 A splendid medieval construction located by Groningen’s marketplace, Der Aa-Kerk welcomed 44 exhibitor stalls lining the central nave, while the church choir was taken over by Diageo, showcasing the Classic Malts and The Singleton. One of the interesting features at WFNN is the presence of independent bottlers and small companies. Food is also well-represented, especially with the gourmet creations of Inge Lanckaker, ‘the chef without a restaurant’, who is passionate about single malts and offers delicious pairings. WFNN clearly demonstrates that a whisky festival can be a success without a corporate organisation behind it – run by an enthusiastic team of 40 volunteers, managed by chairman Roelof Douwstra with the help of Henk Seine. What an incredible energy behind the counter! Obliging, efficient, prompt to react, the blue-sweatshirted workforce perfectly drives a well-oiled machine. A week of intense efforts and work was rewarded by a huge tasting of the ‘leftovers’ on the last evening and a thank you dinner. Volunteering is the signature of WFNN and its great strength. The festival always opens with a whisky dinner, sharpening the senses before the grand tasting of the three following days. For the 11th edition of WFNN, The Glenlivet – and some of the other malts from the Chivas portfolio – were the liquid guests of the eight-course dinner prepared by chef Henrice Dijks from Bistro 't Gerecht, each dish being paired with a whisky. I especially appreciated the slow-cooked beef cheek ravioli with a wild mushroom broth and The Glenlivet 18-Year-Old, the earthy notes of the mushroom playing an elegant score with the whisky’s Sherried profile. Apart from WFNN, Groningen has another gem: one of the best cheese shops I have come across. I shopped in Kaashandel van der Leij for my cheese and whisky seminar, and found some extraordinary pairings. The delicious Millstone Rye found its match with a Crémeux de Bourgogne (full-fat creamy cheese, smooth with a light, sour hint). Glenrothes Sherry Cask Reserve enjoyed the fruity and slightly astringent twist of an Italian cheese washed in Barolo wine. Mackmyra Moment Fenix’ elegant Sherry frame was combined with a four-year-matured Gouda, deliciously salty and crumbly. Tullamore Dew Phoenix matched a medium-matured, fruity Dutch farm cheese called Prima Donna. Finally, Big Peat wrapped its smoke around a tangy Roquefort. If you like it bland and aseptic, walk away! The major innovation of WFNN this year was the launching of The Whisky School, inspired by the Spirit of Speyside Whisky Festival whisky school, of which three WFNN organisers are graduates. Through a three-day programme of intense seminars and visits to local breweries, the 15 students were initiated to the arcane secrets of grain by whisky writer Hans Offringa; Dennis Mulder, co-founder of the WFNN; Patrick Zuidam, master distiller of Zuidam Distillery; Gordon Muir, whisky tutor; and Vic Cameron, head of the Spirit of Speyside whisky school. I hosted a seminar on the art of blending, followed by a ‘create your own blend’ workshop, using cask samples from Zuidam Distillery. The Whisky School is a courageous initiative which seems to have delighted this year’s students. Do supermarkets threaten Dutch whisky shops? Could the introduction of whisky to Dutch supermarkets damage independent spirits retailers? The Whisky Exchange Whisky Show scaled up for its 10th anniversary edition in London. Designers are invited to create the artwork for a 24-year-old Springbank bottling. There’s a camaraderie building between Scotch and ‘other’ whiskies, says Dave Broom. Tasting everything from rare old malts to fresh-faced new spirit from the broader whisky world.